Big data have been used for a variety of unusual things, but its latest use might be its most strange yet: The hunt for Sasquatch. 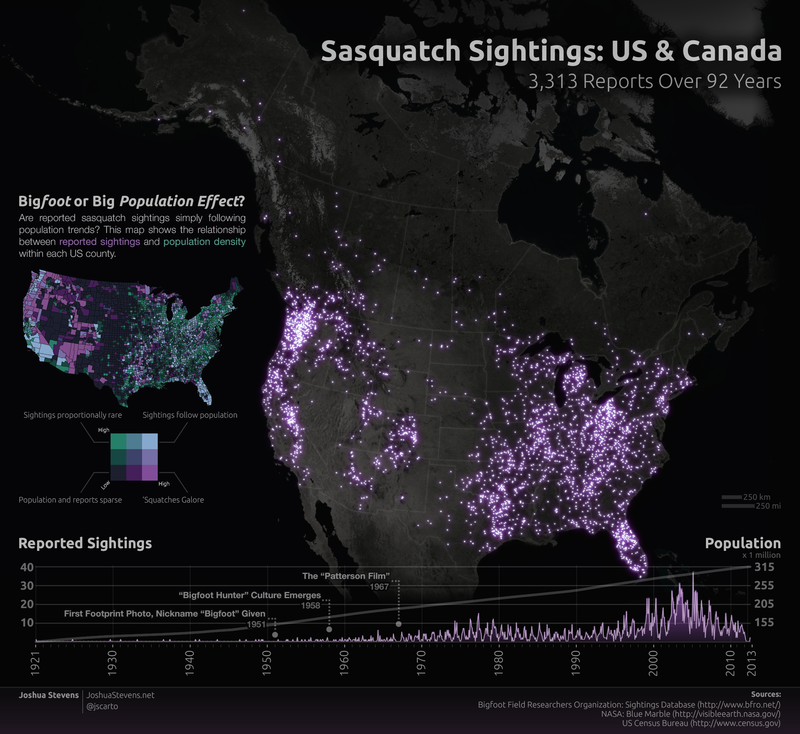 Josh Stevens, a PhD candidate at Penn State University, has compiled 92 years worth of data on Bigfoot, showing where the mythical creature has reportedly been wandering—and how it compares to population growth in North America. Perhaps not surprisingly, the data—which include 3,313 sightings—shows the majority of Bigfoot sightings have been in the western part of the U.S., particularly in the Pacific Northwest. But sightings in Florida and along the Appalachian trail are not uncommon either. Bigfoot has been a part of North American lore for more than 400 years, according to the Bigfoot Field Researchers Organization (BFRO), the source of Stevens' data. The first footprint was taken in 1951, but it hit the pop culture spotlight in 1967 when a film purported to catch a Bigfoot walking. While many dismiss it all as a hoax, the organization said the data suggest the presence of a primate that exists in areas with low population densities—one that is "astonishingly adept at avoiding human contact through a process of natural selection." That syncs up with what Stevens found— as well. "You would expect sightings to be the most frequent in areas where there are a lot of people," he said in his presentation of the findings. "But a bivariate view of the data show a very different story. There are distinct regions where sightings are incredibly common, despite a very sparse population. On the other hand, in some of the most densely populated areas, sasquatch sightings are exceedingly rare." While many people relegate Bigfoot sightings to the '70s and '80s, when there were films and TV shows focusing on the hunt, the number of people claiming to have seen one actually increased dramatically between 2000 and 2010, spiking between 2005 and 2006 to more than twice the highest number in the late-'70s. They've tapered off regularly since then, with fewer than 10 in the past year. The most recent potential Bigfoot activity occurred Sept. 19, when an Ohio woman found a footprint in her backyard that measured 7.5 inches wide. That report came just one day after another Ohio woman said she saw a creature resembling the description of Bigfoot. Ohio, according to the BFRO website, is ranked fifth in the U.S. for Bigfoot sightings (behind Washington, California, Florida, and—barely—Illinois). But Stevens theorizes that states that have a high number of sightings could be feeding on that speculation. "The desire to find, or think you saw, Bigfoot might be especially high if you've heard tales of giant, ape-like creatures calling the place you're in home," he notes. "A combination of environment and legend likely combine to at least put weary outdoorsmen on the lookout." However, he admits, there's a potential flaw in that logic, since the population data in the study are based on the U.S. Census—and there's no differentiation in sighting reports on whether they came from residents or from people vacationing in the area. Additionally, he notes, the reports are tied to the nearest city, rather than precise geopositioning coordinates. ("Would you really log a GPS reading while staring 'squatch in the eye?!" he asks.) That can skew the data in the direction of populated areas, when the actual sightings could be miles away. As for Stevens, he's careful to note that while he's happy to compile the data, he's still not quite ready to join the Bigfooter movement. "I'm not convinced there's a descendant of Gigantopithecus playing hide and seek in the Pacific Northwest," he says. "But if respectable folks like Survivorman Les Stroud and primatologist Jane Goodall believe there's something more to the myth, I think it's at least worth putting on the map."